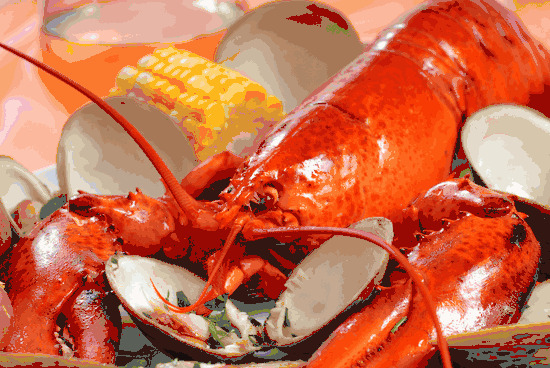 How to cook your Live Lobster Clambake! Home > Mother's Day Dinners! > Lobster Clambakes! > How to cook your Live Lobster Clambake! This simple to cook clambake will definitely be a hit! We include professionally prepared clambake cooking instructions with your order, but here is a quick overview! First, Remove The Gel Pack(s) and Newspaper packaging that are On Top, Under the Clambake Lid. For 1 and 2 person bakes, add 1 1/2 cups of water to the contents of the can. For 3 and 4 person bakes, add 2 1/2 cups of water to the contents of the can. Second, place lid back on can. Third, place entire can on stovetop or grill until steam rises from vent holes in the cover. Fourth, gradually reduce heat in small increments until the steam is barely rising from the lid. it will be hot, so take care with it. Fifth, use the potato on top for your guide...we call it the "tester". Test the potato with a fork and when the potato is done, your bake is cooked to perfection. The usual cooking time is about 60 minutes.